Since our last publication update in August 2016, BFS researchers have been very active indeed. We’ve posted seventeen new peer-reviewed articles and conference papers on the BFS website! 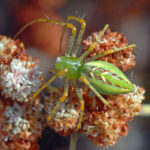 The new publications report research on a wide variety of projects, including carbon and nitrogen storage in soil, effects of drought on bird species richness, a revised taxonomy of a cleptoparasitic (cuckoo) bee genus, refuges that enable native snails to avoid heat and dessication, genetics of nitrogen-fixing sympbiotic bacteria, interactions of non-native grasses with native annuals, genetics of fairy shrimp, using underwater robots to track marine life and examine archeological sites, effects of leg loss on reproduction of Green Lynx Spiders, effects of disturbance on ground spider populations, and others! 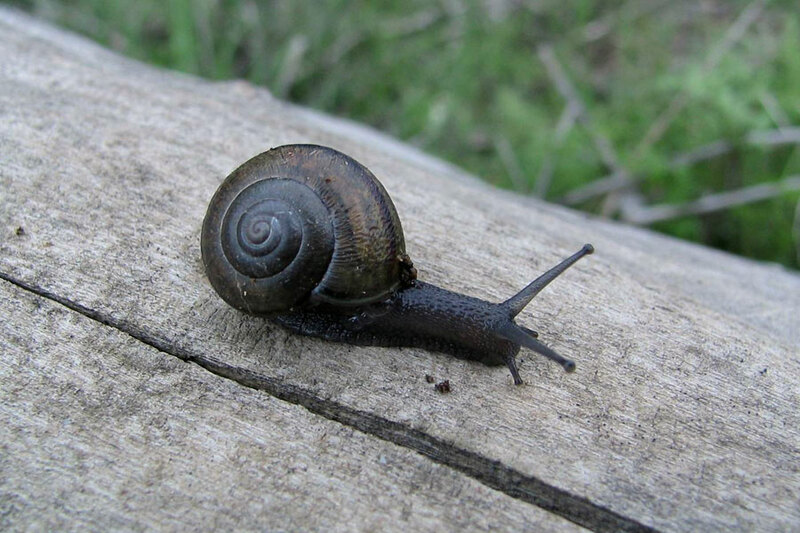 California Shoulderband (Helminthoglypta tudiculata) – see Osborne & Wright (2018). 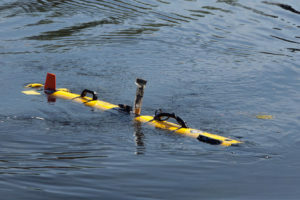 A robot ready for deployment at pHake Lake – see Lin et al. (2017), Viswanathan et al. (2017), Anderson et al. (2016), and Smith et al. (2016). 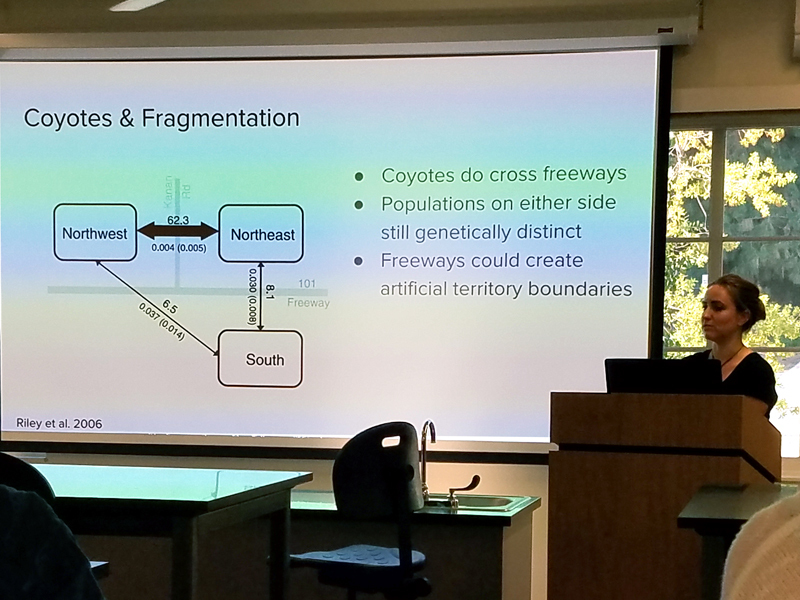 Symposium Celebrates BFS Senior Thesis Research! 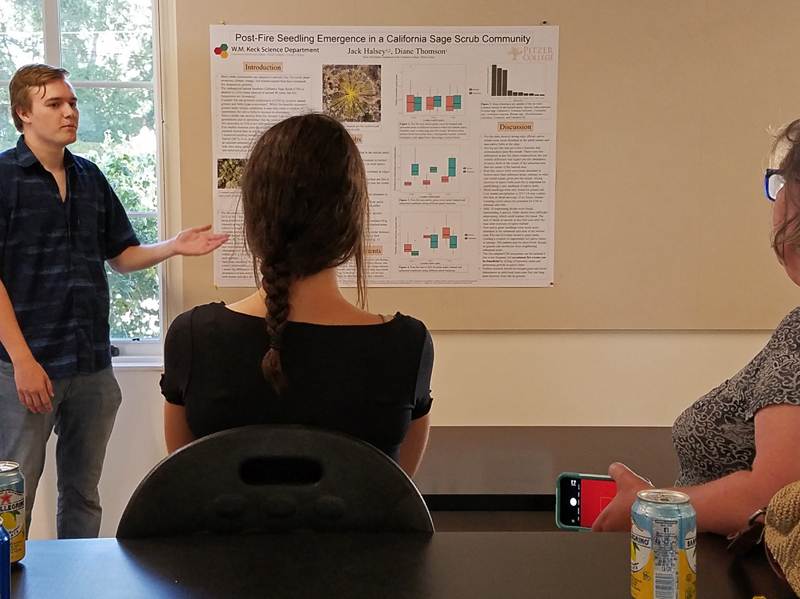 Jack Halsey presents his poster on the effects of fire on seed germination. Ellie Harris talks about fire effects. Jack Litle talks about the effects of herbivory. 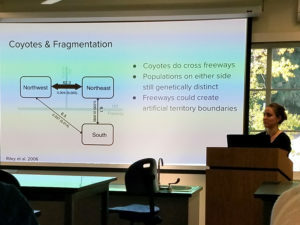 Savanah Bird discusses how the 210 freeway affects genetic diversity in coyotes. Savannah Meadors talks about processes that determine the survival and distribution of White Sage (Salvia apiana). 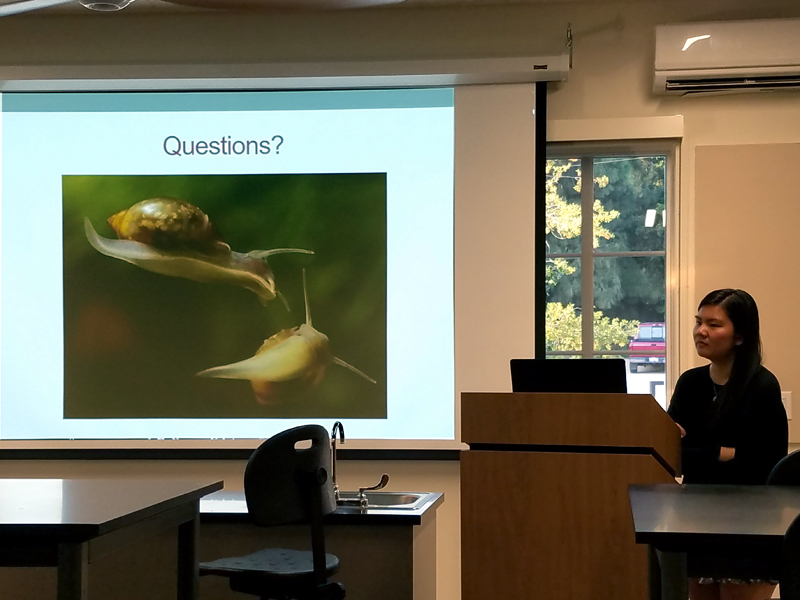 Kay Garlick-Ott takes questions on her presentation of how temperature impacts mating behaviors in the freshwater snail Physa acuta. CONGRATULATIONS TO ALL THE SENIORS FOR A JOB WELL DONE! Celebrate Earth Day 2018 at the BFS April 21! 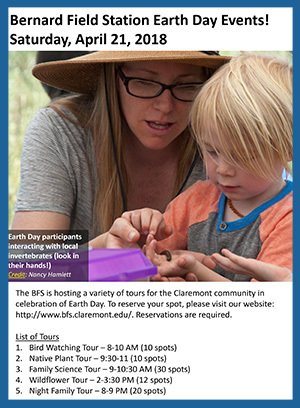 On Saturday, April 21, the BFS is hosting a variety of tours for the Claremont Community in celebration of Earth Day 2018. A list and description of the different tour options is below. We do expect that tours will fill up quickly, so please sign up as soon as possible (see links to tour sign-ups below). For a taste of what to expect, check out these scenes from last year’s Earth Day Celebration! Once registered, it is critical that all participants arrive at least 5 to 10 minutes early. Everyone will need to sign a waiver of liability. Everyone under 18 must be accompanied by a parent/legal guardian. Please prepare yourself for the conditions. We recommend that everyone wear closed-toed shoes, long pants, and a hat. Sunscreen and water are also recommended – and critical if it is hot. Specific equipment for each tour is listed under the description. 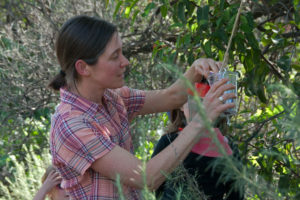 Prof. Catherine McFadden from Harvey Mudd College will be leading a bird-watching tour. 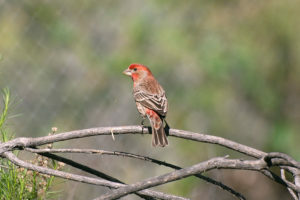 For a list of birds that you may see while at the BFS refer to the BFS list of bird species. Records of birds observed during the monthly surveys at the BFS can also be explored on eBird. People of all ages are welcome, but everyone must be in good enough shape to hike for ~ 2 hours. Please bring your own binoculars. We do have a few for people who don’t have any, but please indicate on your registration form if you require binoculars. Water, closed toed shoes, and sun protection required. 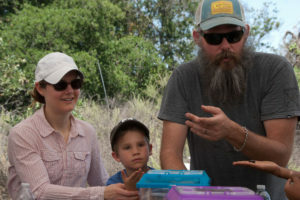 Mammal Diversity and Ecology, where Prof. Paul Stapp from Cal State Fullerton, will be introducing participants to mammals found at the Bernard Field Station. People of all ages are welcome, but the focus of this event is for K-12 students interested in science. Everyone must be in good enough shape to hike for ~ 1.5 hours. Water, closed-toed shoes, and sun protection required. 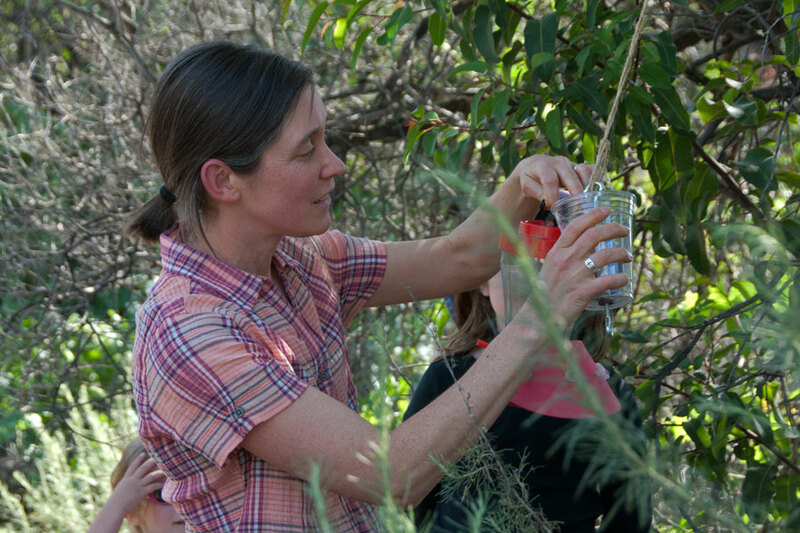 Dr. Susan Schenk will be leading a tour focused on native plants found at the field station for those interested in Southern California plant communities. People of all ages are welcome, but everyone must be in good enough shape to hike for ~ 1.5 hours. 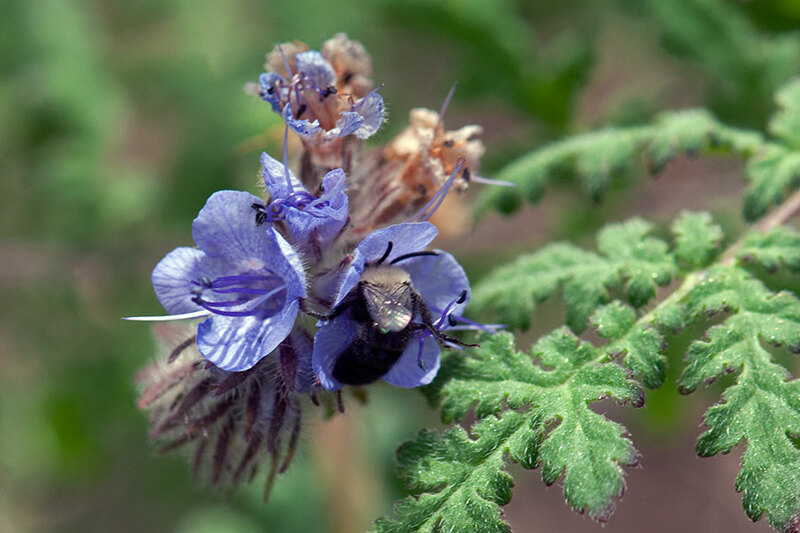 Professor Nancy Hamlett from Harvey Mudd College will be leading a wildflower tour. 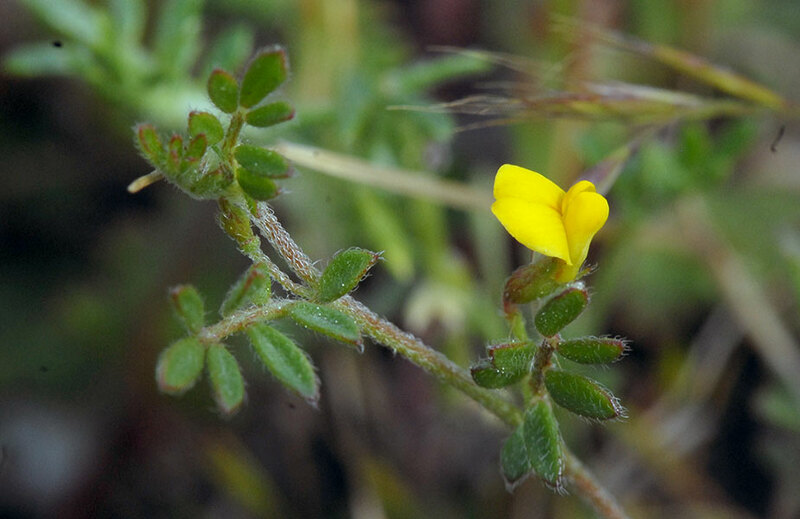 The late rains and the fire have provided unique opportunities for viewing wildflowers. People of all ages are welcome, but everyone must be in good enough shape to hike for ~ 1.5 hours. Insects of the Night, where Professor Jonathan Wright from Pomona College will teach participants about various insects active at night. People of all ages are welcome, but the focus of this event is for K-12 students interested in science. Everyone must be in good enough shape to hike for ~ 1 hour. Please bring a flashlight with you. Water and closed-toed shoes required. If you have any questions, please contact the BFS Director, Wallace Meyer, at wallace.meyer@pomona.edu. For more about the vertebrate monitoring program, check out the PRISSM website. eBird has recently implemented a number of new features. 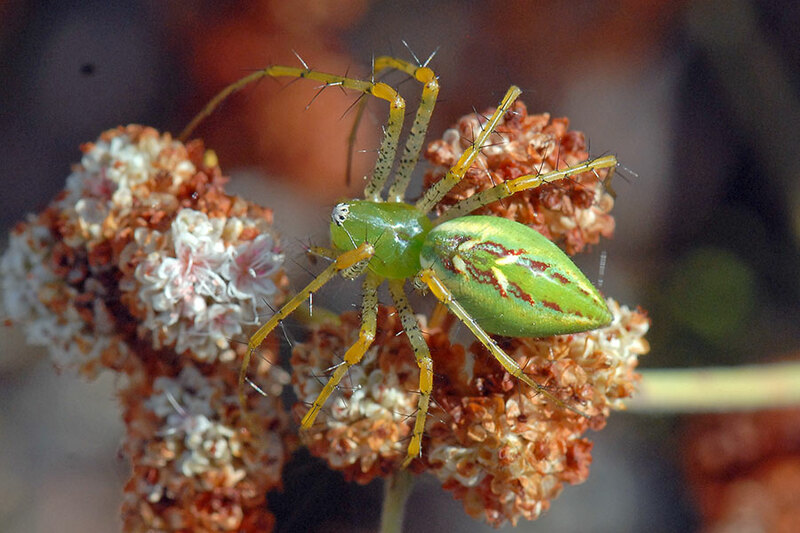 You can get histograms of sightings by season, find detailed information on a particular species, access photos, audio files and comments, and view an illustrated checklist or download a printable checklist. For more information on accessing all these features, please see our updated instructions for viewing BFS data on eBird. 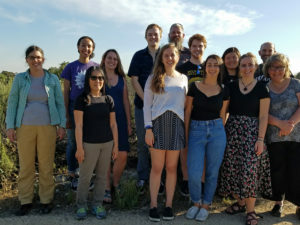 Many thanks to Prof. Cathy McFadden, Harvey Mudd College, whose monthly BFS bird surveys (2001-present) provided the vast majority of the eBird data. Additional observations have been contributed by the 5C Birding Club as well as other BFS researchers and visitors. If you have bird observations, photographs, or audio recordings from the BFS, please consider contributing them to eBird! The ordering of some families and species has been changed. 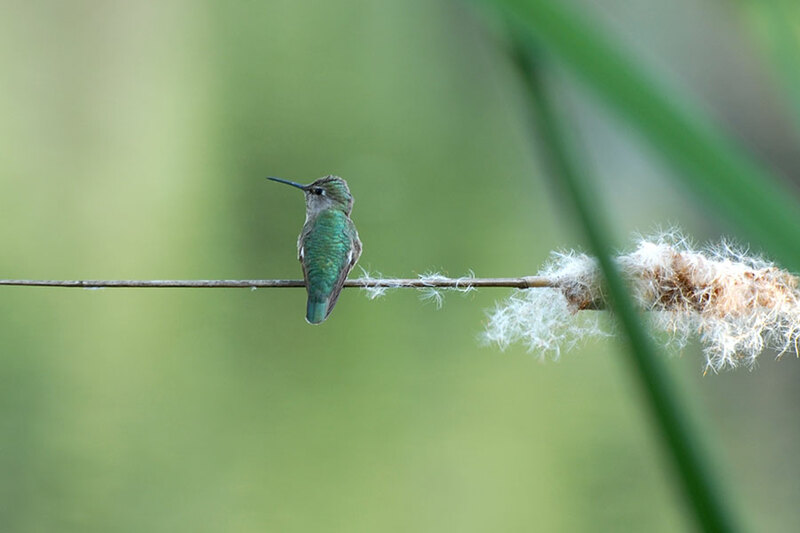 An Anna’s Hummingbird perches on a cattail at pHake Lake. © Nancy Hamlett. Some scientific names have been changed. The House Finch, which was formerly Carpodacus mexicanus, is now Haemorhous mexicanus. © Nancy Hamlett. Some species have been moved to different families. 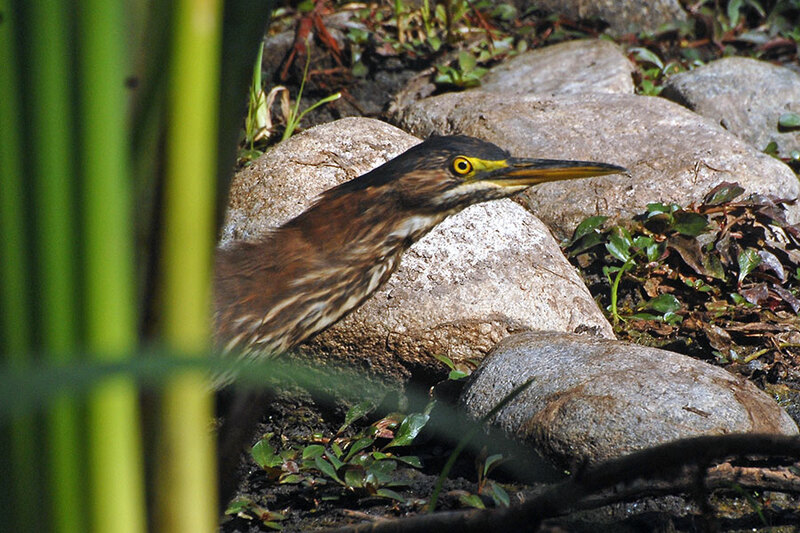 A Green Heron skulks through the cattails at pHake Lake. © Nancy Hamlett. Western Scrub-Jays were split into two species. 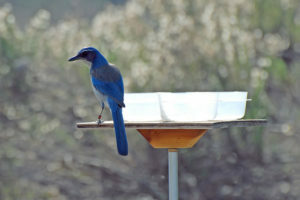 The one at the BFS still retains the same scientific name, but is now the “California Scrub-Jay”. This California Scrub-Jay participated in a study and apparently hopes that the photographer is coming to fill up its seed bowls. © Nancy Hamlett. 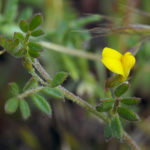 BFS photo links now connect to the photo database rather than to individual species pages, and lots of new photos of BFS bird life have been added – a sampling is scattered throughout this post. 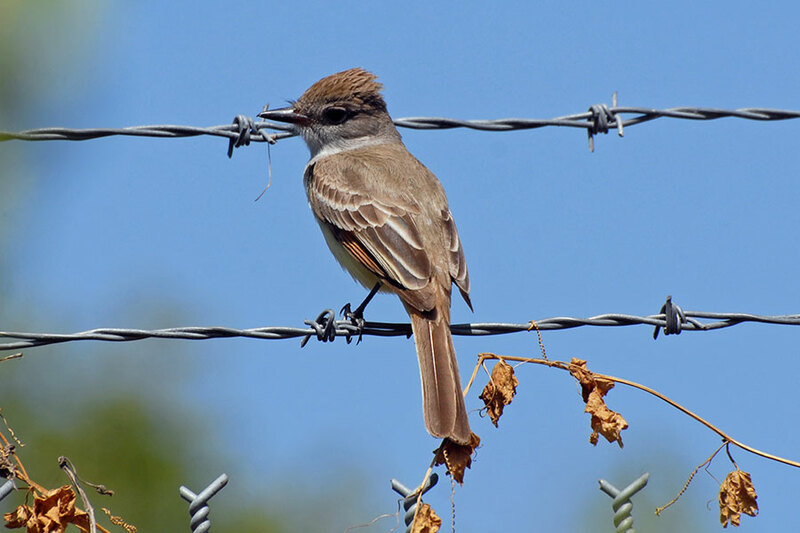 One of the newly added photos – an Ash-throated Flycatcher sits on the fence by College Avenue. © Nancy Hamlett. The “Source” column has been eliminated. 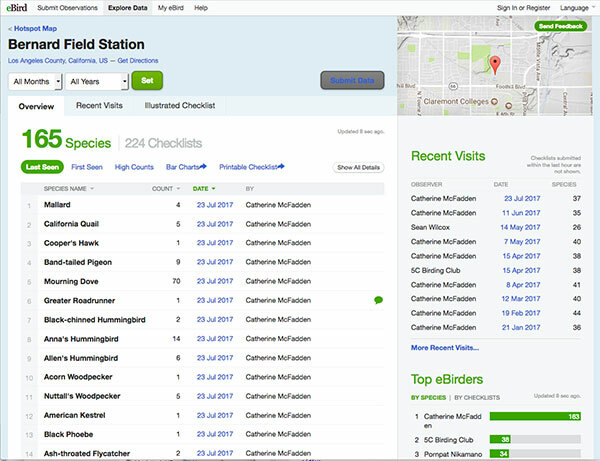 When the online bird list was first created, a variety of sources were used to document the presence of a species at the BFS – hence “Source” column. Since then, however, Prof. Cathy McFadden has collected data from 16+ (!) years of monthly systematic bird surveys, so the original varied sources are no longer relevant. 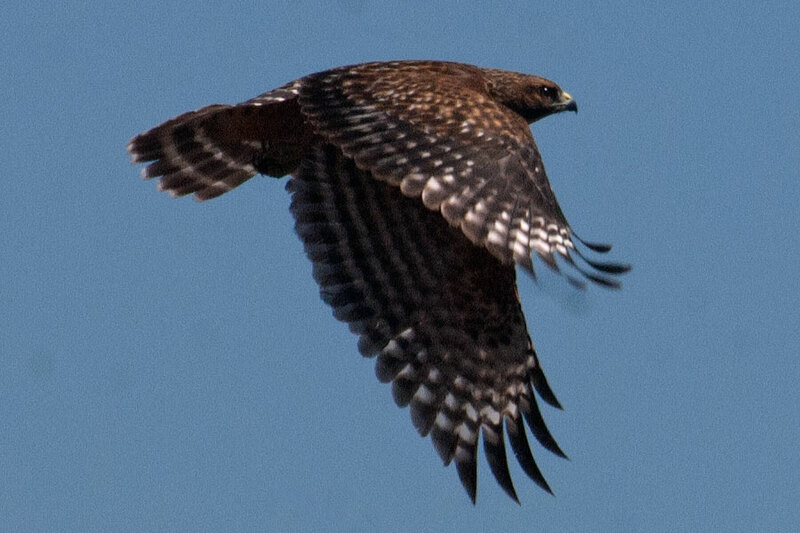 An immature Red-Shouldered Hawk flies by. © Nancy Hamlett. 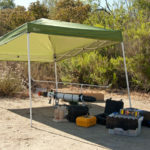 Conservation status listings have been limited to designations established by US Fish & Wildlife Service, California Department of Fish & Wildlife, the North American Bird Conservation Initiative, or Partners in Flight. 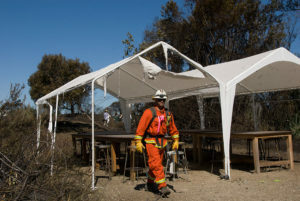 Bureau of Land Management and California Department of Forestry designations have been removed since they only apply to the lands managed by those agencies. 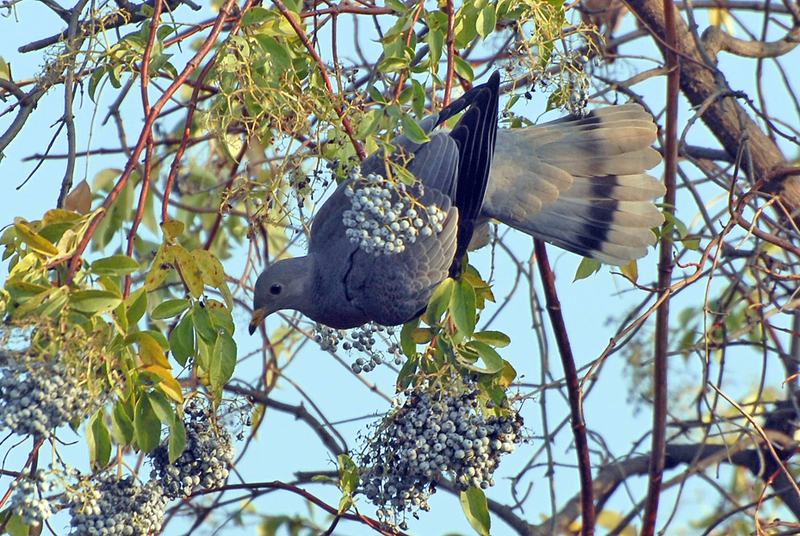 A Band-tailed Pigeon, which is on the North American Bird Conservation Initiative and Partners in Flight watch lists, does acrobatics whilte reaching for elderberries. © Nancy Hamlett. The introductory notes have been modified to reflect the various changes and to place important information in a more prominent position. 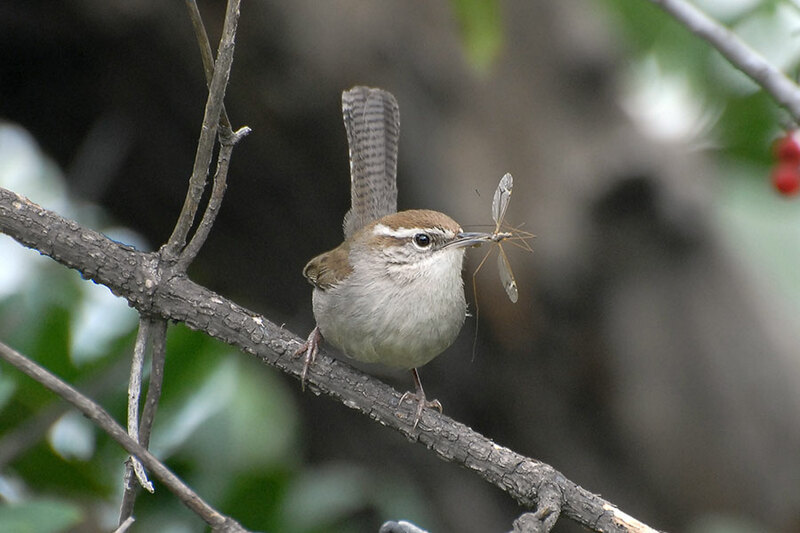 A Bewick’s Wren takes a crane fly to the nest for its young. © Nancy Hamlett. Links to the BFS photo database, All About Birds, Birds of North America, and CalPhotos have all been checked and updated as needed. 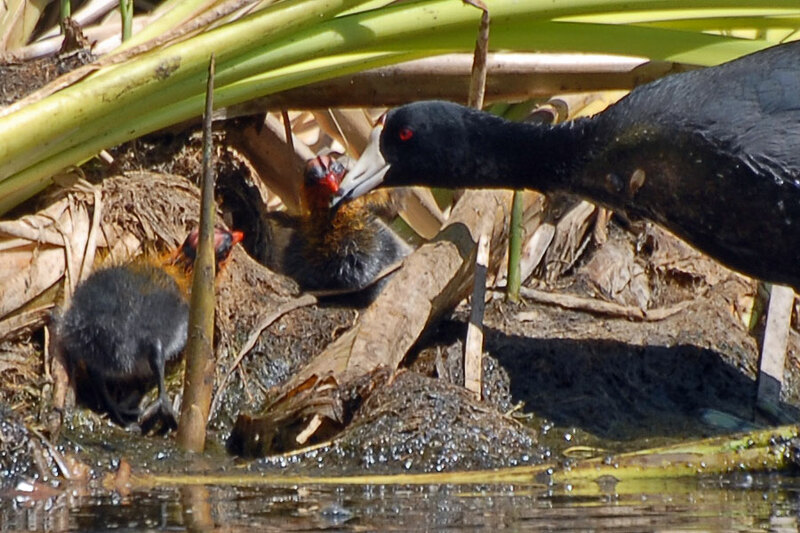 An American Coot feeds its chicks. © Nancy Hamlett. 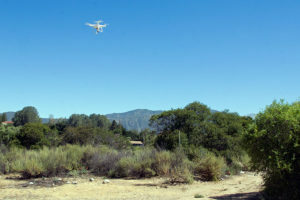 The Bee Lab drone checks out the burn! HMC student researcher Matt Crane with the bee lab drone. ©Nancy Hamlett. You can read more the impact of the fire on the bee lab’s research on Matt’s post, “I Don’t Want to Set the World on Fire” on the Bee Lab blog. The drone returning from surveying the fire. ©Nancy Hamlett. 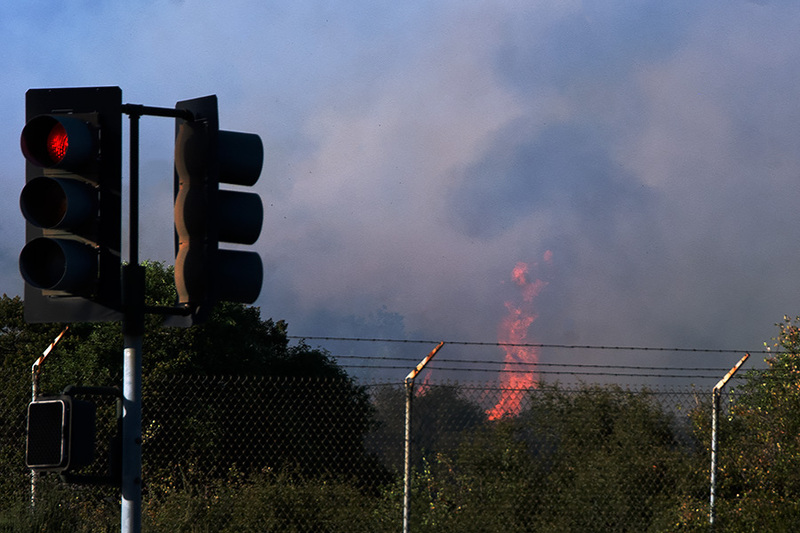 Late in the afternoon of May 18, a fire started inside the BFS fence along College Avenue. Although the fire was thought to have been quickly extinguished, the wind came up and blew embers east so that the fire quickly spread to pHake Lake and along the south shore of the lake. 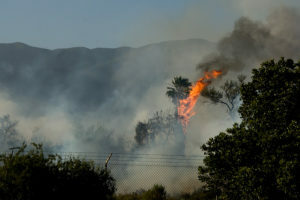 The fire eventually covered about four acres before it was stopped just east of the lake, thanks to an outstanding response from the Los Angeles County Fire Department. 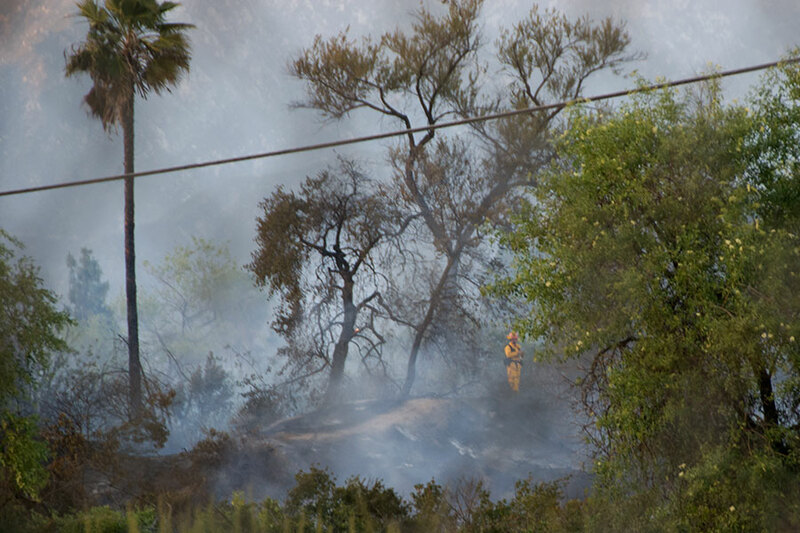 Fortunately, no one was injured and no structures were damaged. 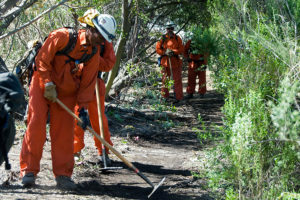 The native sage scrub, which is fire-adapted, will recover. 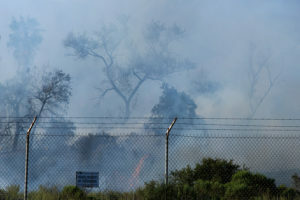 The area south of pHake Lake enveloped in smoke and flames. ©Nancy Hamlett. Dead palm fronds in flames. ©Nancy Hamlett. The Los Angeles County Fire Department responded quickly, summoning a dozen fire engines from surrounding communities and three water-dropping helicopters. 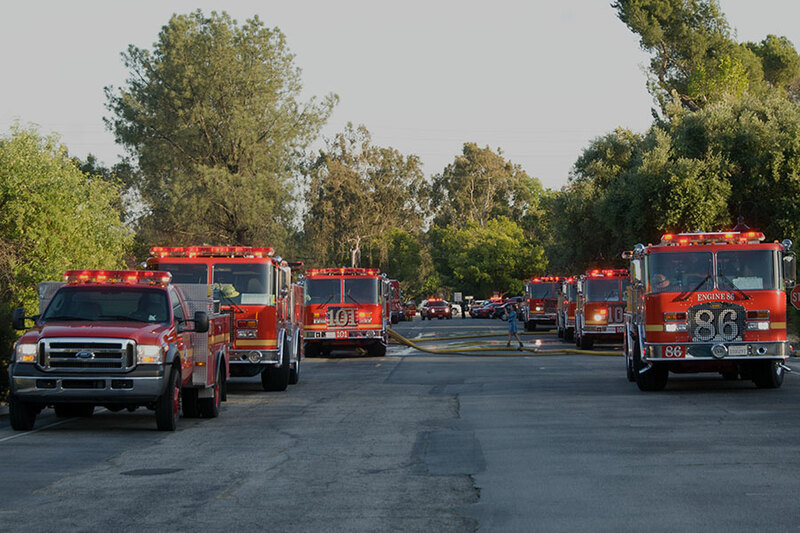 Fire engines and other emergency vehicles on College Avenue. ©Nancy Hamlett. Two water-dropping helicopters. ©Nancy Hamlett. Fire crews heading into the field station. ©Nancy Hamlett. 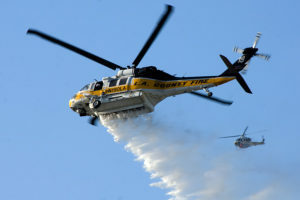 A firefighter manning the hose while a helicopter drops water. ©Nancy Hamlett. 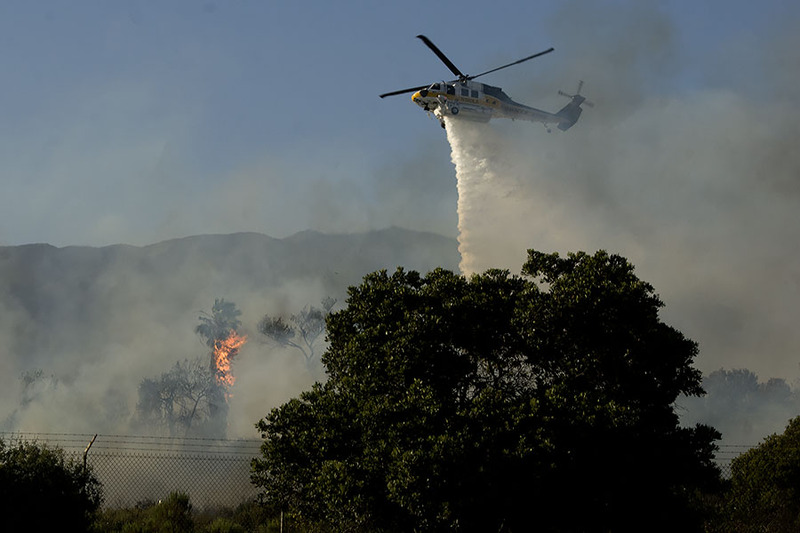 A helicopter dropping water on the fire. ©Nancy Hamlett. As the wind blew embers, new sites ignited. 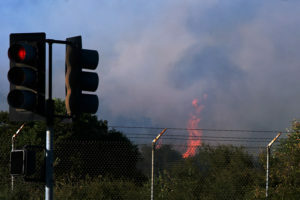 Flames leaping up on the south shore of the lake. ©Nancy Hamlett. At the command center, a computer screen displays the location of each firefighter. ©Nancy Hamlett. 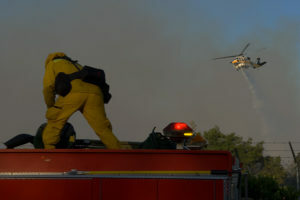 A firefighter on the south shore of pHake Lake. ©Nancy Hamlett. 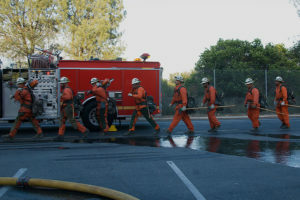 On Friday, a small group was allowed in to assess damage as fire crews continued to work to ensure that no hot spots remained. Firefighters clearing the lake trail and checking for hotspots. ©Nancy Hamlett. 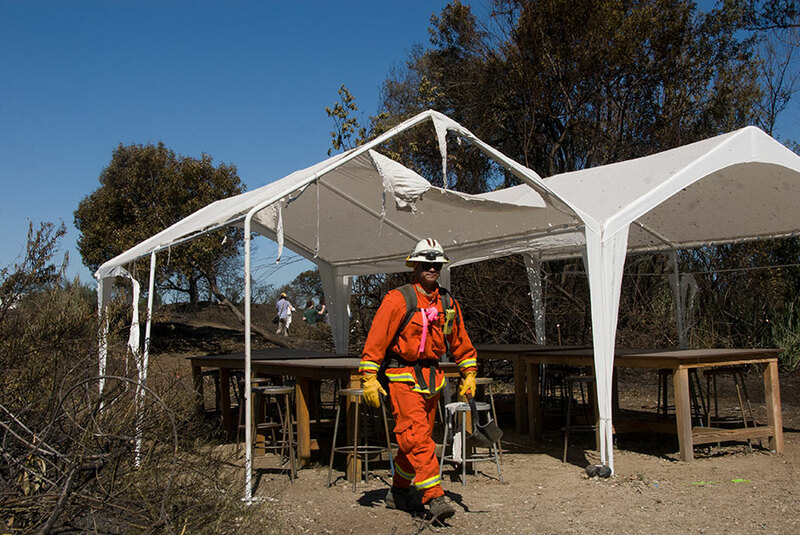 A firefighter walking through the damaged temporary outdoor classroom. ©Nancy Hamlett. 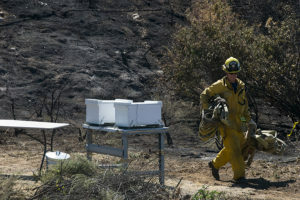 A firefighter walking past the Donaldson-Matasci lab bee hives, which were saved. ©Nancy Hamlett. 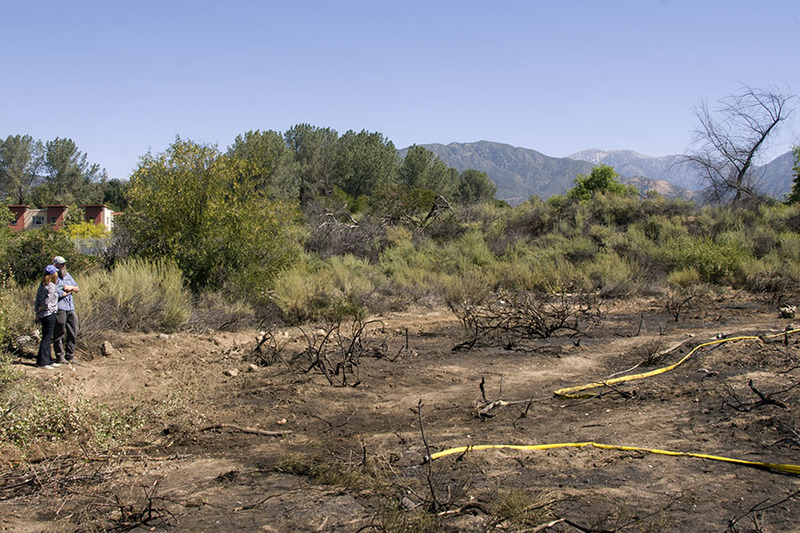 BFS Lead Dean Audrey Bilger and BFS Director Marty Meyer looking at the site where the fire started. ©Nancy Hamlett. The cause of the fire is unknown, but it must have resulted from human activity since there was no lightning or other natural cause that could have started the fire. 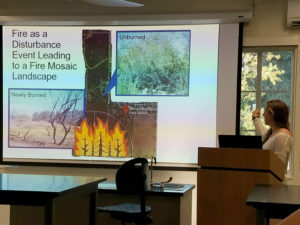 This is, alas, too typical of Southern California as a whole, where 95% of wildfires are caused by humans (Syphard et al. 2007). 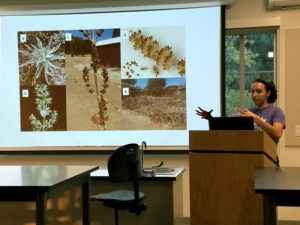 The resulting increased frequency of wildfires can mean that even in fire-adapted plant communities, some organisms have insufficient time to re-establish between fires (Koh and Levins 2010). 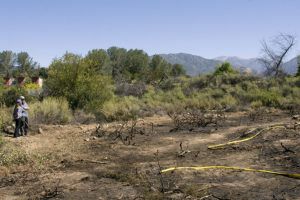 The early May date for this fire – much earlier than the start of the traditional fire season in Southern California – may in part reflect cumulative effects of the multi-year drought and on-going climate change, a topic addressed by Professor Char Miller, Pomona College, in a commentary in the Daily Bulletin. 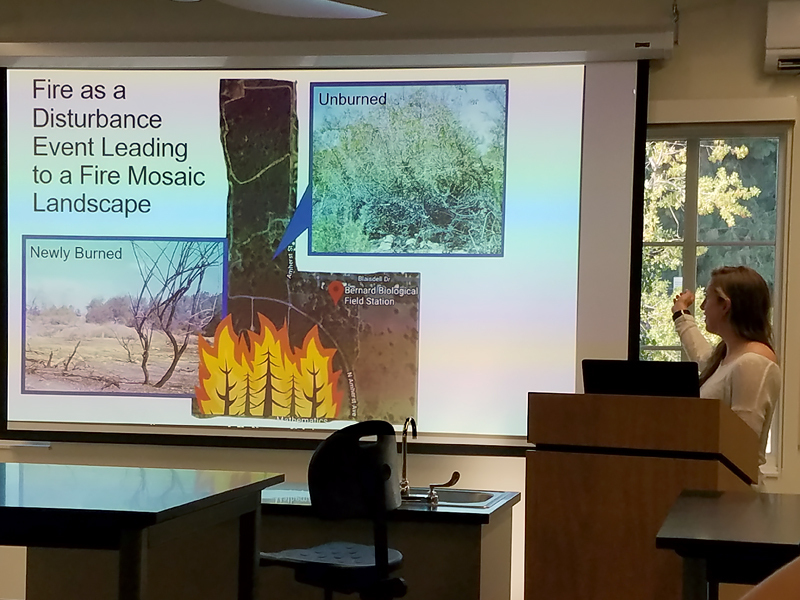 Climate change models predict that the area burned in California will increase over the next 30 years. Recent work, however, indicates that a substantial portion of the predicted increase is actually due to human activity rather than climate change per se (Mann et al. 2016). 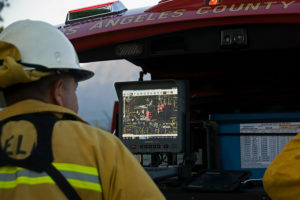 Understanding the interplay of these various factors is obviously important for managing fire in Southern California, especially at the urban-wildland interface. 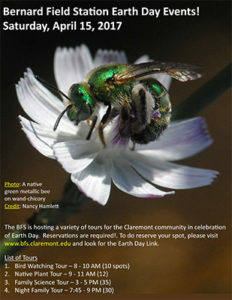 We at the Claremont Colleges are fortunate that students have a resource like the BFS, where they can study these issues. Koh SW and Levins S. 2010. 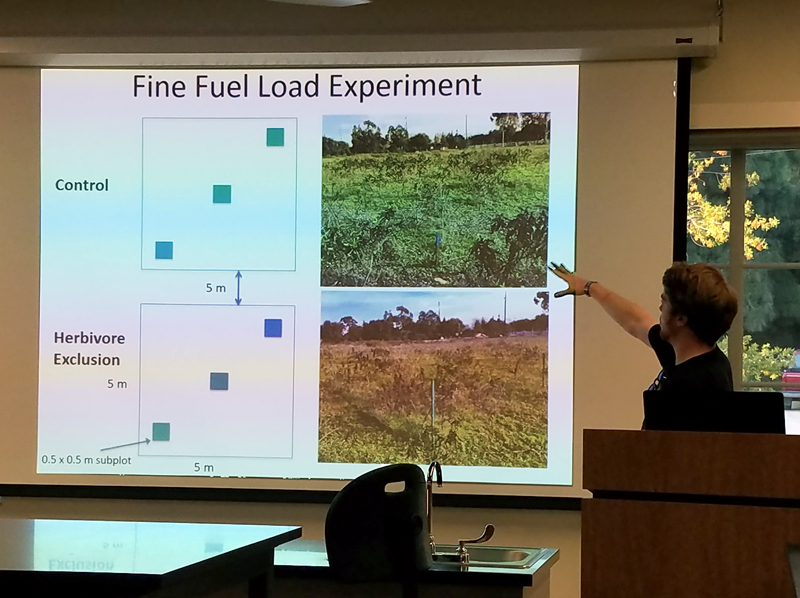 Wildfires and the metapopulation dynamics of saproxylic lichens. 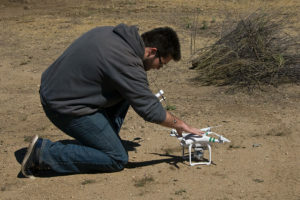 Southern California Conferences for Undergraduate Research. 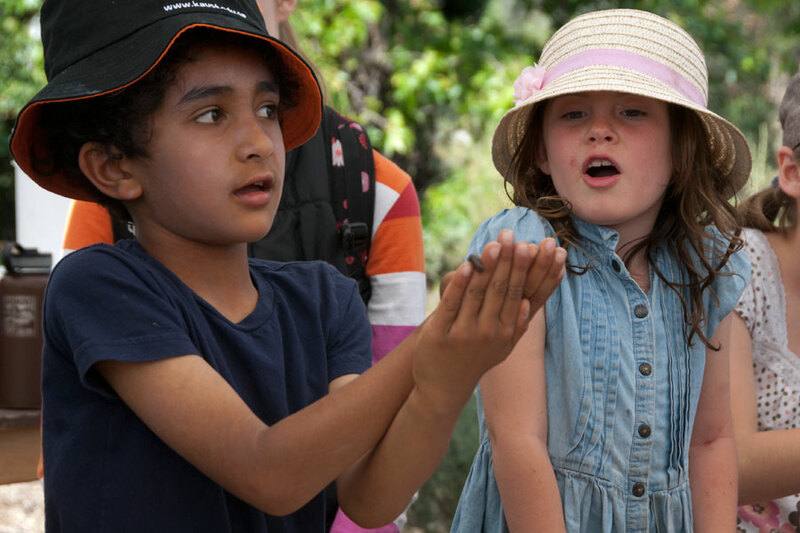 One of the most popular events was the Family Science tour. 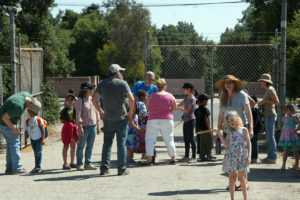 Families gather for the science tour. At the Invertebrate Station, BFS Director Marty Meyer introduced families to some of the invertebrates at the field station, including millipedes, centipedes, beetles, and snails. 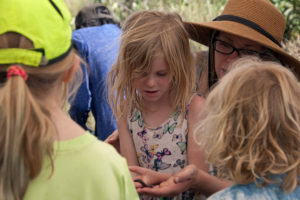 Marty explains millipedes to a rapt audience. Families got to let a big millipede crawl on their hands – very exciting! At the Bird Ecology Station, Prof. Elise Ferree from the Keck Science Department showed how her research group studies hummingbird ecology. Professor Ferree at a hummingbird feeder. Elise Feree shows a visor that her students modified to keep bees out of the hummingbird feeder. 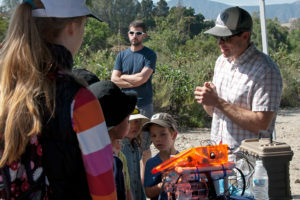 At Robotics for Bio-monitoring, Professor Chris Clark and his students from Harvey Mudd College described the equipment his group makes and uses for bio-monitoring. Prof. Chris Clark explains the robots and how they work. Harvey Mudd students show families the robots they made. Families actually got to operate robots that are used to monitor biota (including sharks!) in aquatic systems. 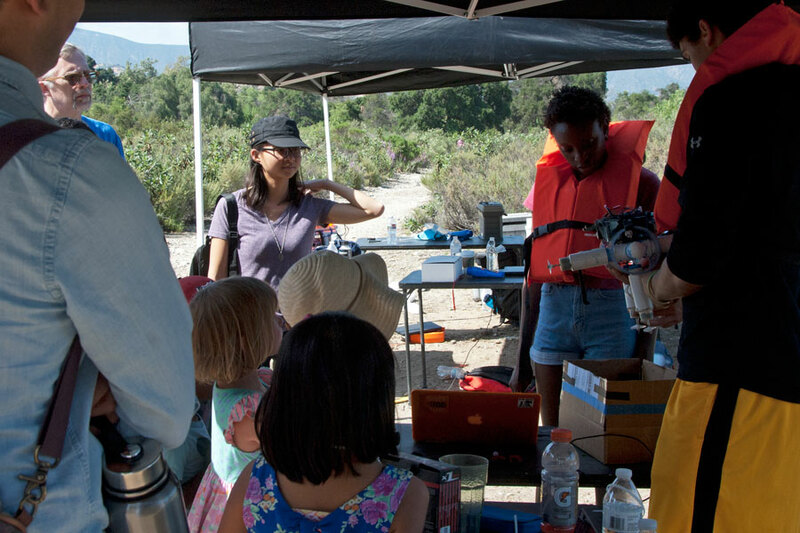 A young visitor drives a robot in the lake. The robot in the lake. The Night Family Tour was also very popular. 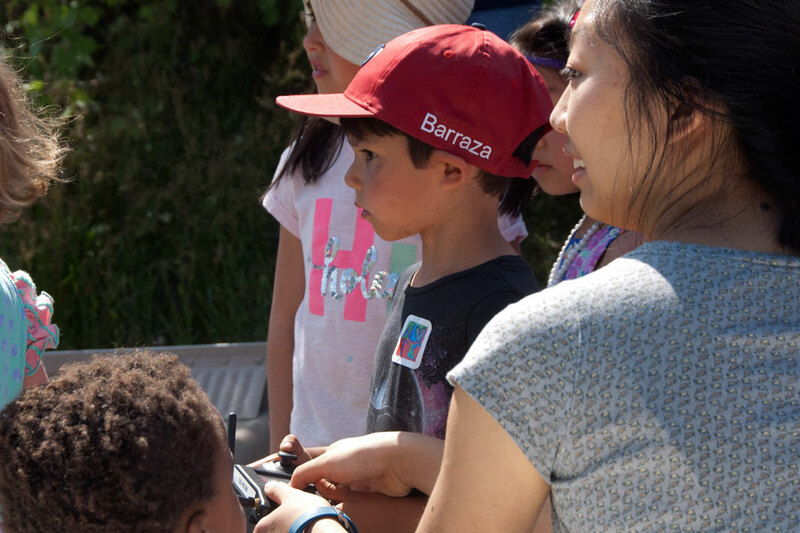 Families looked at the night sky with the Keck Science Department telescope and learned about nocturnal animals of the BFS from Prof. Paul Stapp from Cal State Fullerton. 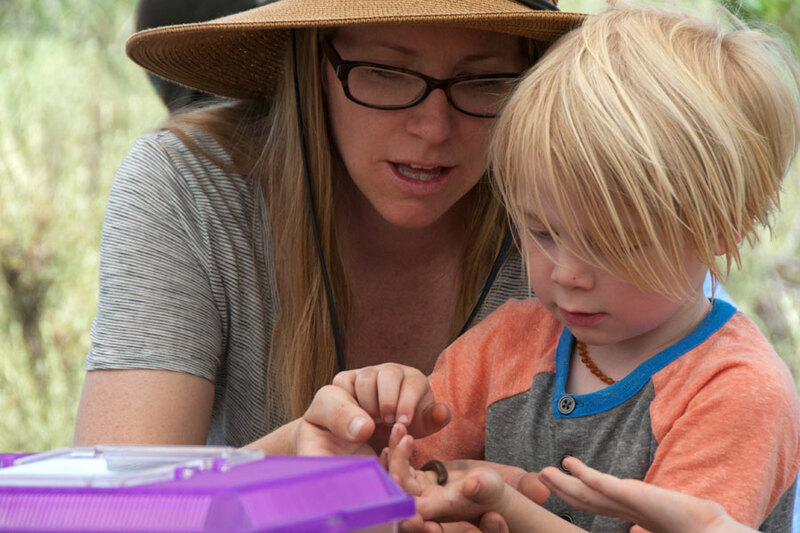 Prof. Stapp shows families a deer mouse. We don’t have many photos because it was, well, er, dark. 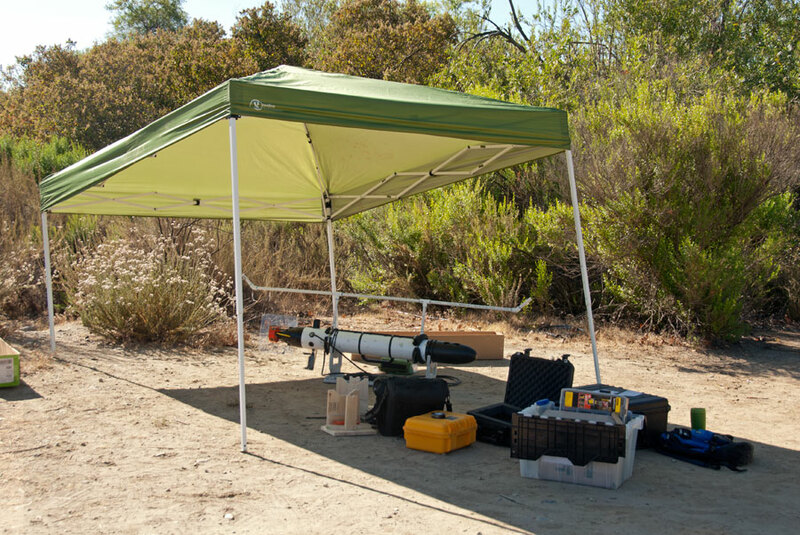 Check out the Bernard Field Station Facebook Page for more photos. A list and description of the different tour options is below. We do expect that tours will fill up quickly, so please reserve your spot as soon as you can. 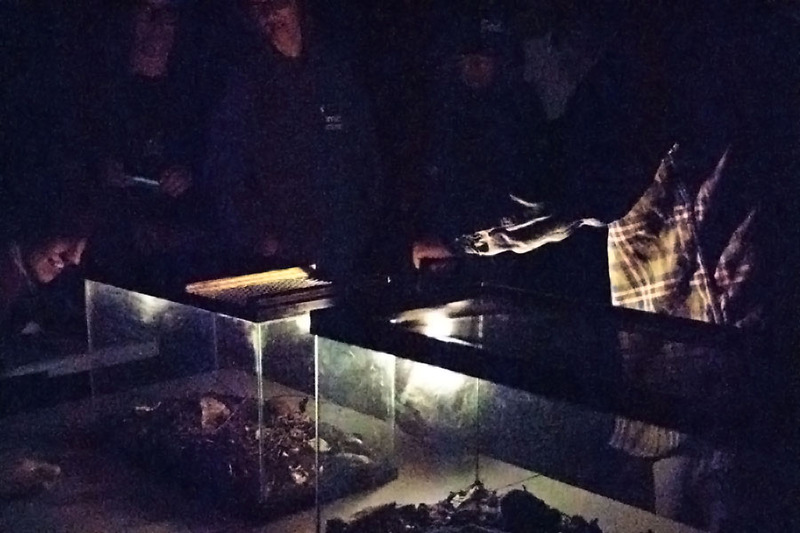 Numbers for each tour are limited to make sure that participants are provided a wonderful experience. Just use the links below each tour to access the appropriate registration form. Once registered, it is critical that all participants arrive at least 5 to 10 minutes early. Everyone will need to sign a waiver of liability. Everyone under 18 must be accompanied by a parent or legal guardian. Please prepare yourself for the conditions. We recommend that everyone wear closed-toed shoes, long pants, and a hat. Sunscreen and water are also recommended and critical if it is hot. Specific equipment for each tour is listed under the description. 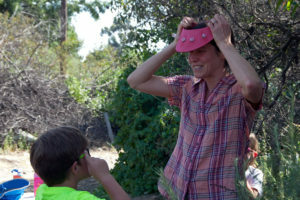 Professor Susan Schenk from Keck Science will be leading a native plant tour. 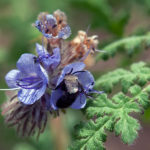 The heavy rains have provided unique opportunities for viewing native shrubs in their glory and many wildflowers. People of all ages are welcome, but everyone must be in good enough shape to hike for ~ 2 hours. 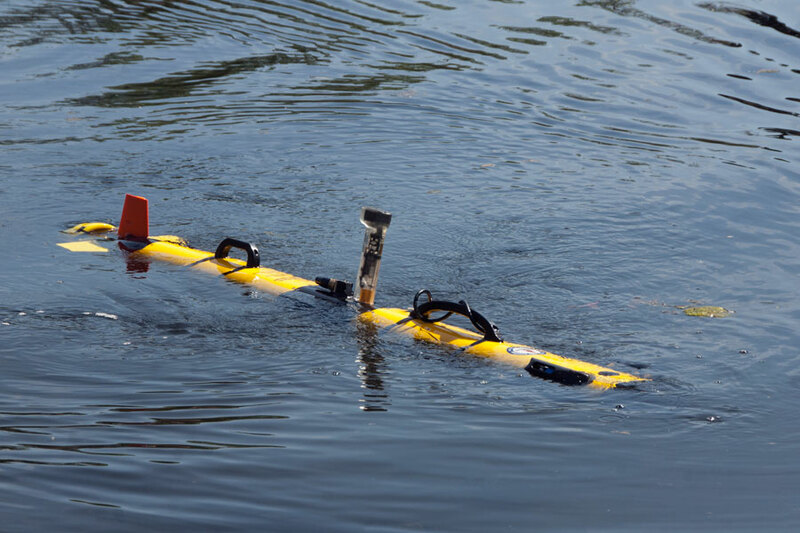 Robotics for Bio-monitoring, where professor Chris Clark from Harvey Mudd College will describe the equipment and let people operate robots that are used to monitor biota in aquatic systems. 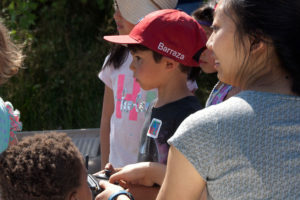 Bird Ecology, where Professor Elise Feree from Keck Science will teach people to identify local bird species and focus on aspects hummingbird ecology. 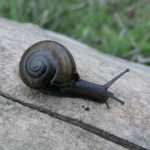 Invertebrates, where BFS Director Wallace Meyer will introduce you to some of the invertebrates at the field station. People of all ages are welcome, but the focus of this event is for K-12 students interested in science. Everyone must be in good enough shape to hike for ~ 2 hours. Bat Surveys and Night-time Mammals, Professor Paul Stapp from Cal State Fullerton will teach participants how to survey for and identify different bat and other nocturnal mammal species.